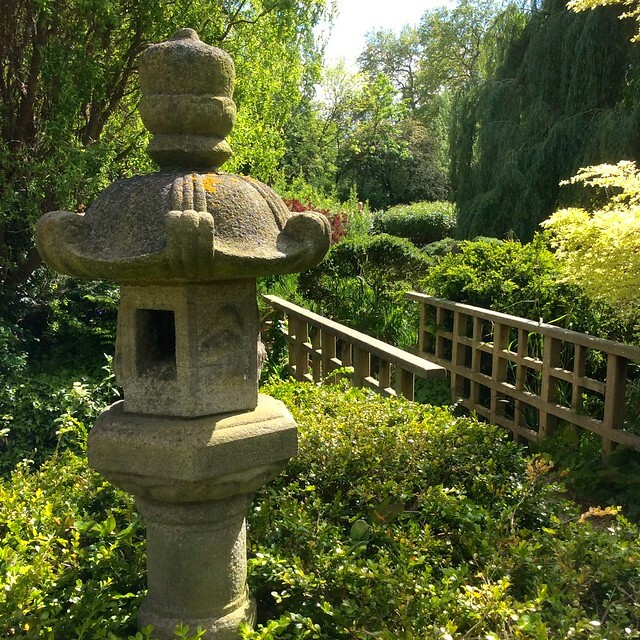 I’ve travelled all over London to visit obscure Japanese gardens in out of the way places, but all the time I never realised there was one much closer to home – in Regent’s Park, no less. It’s part of Queen Mary’s Garden and it’s not just a garden, it’s a whole island. In case you’ve missed it too, let me take you on a short tour. 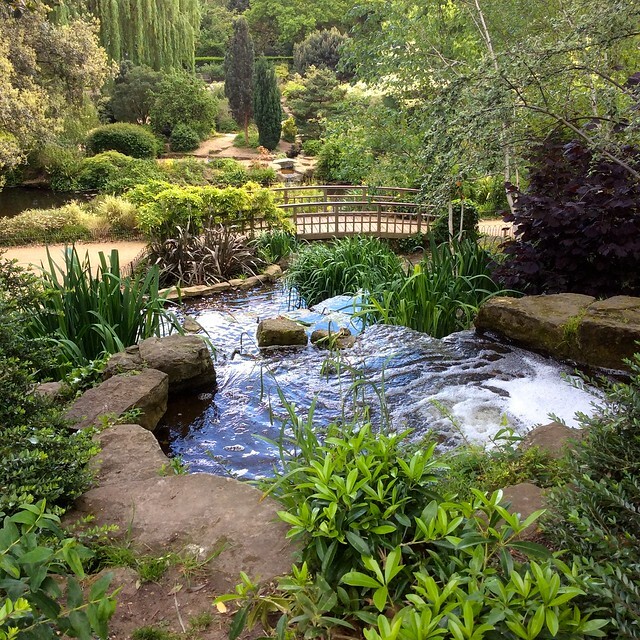 Queen Mary’s Garden was planted in the 1930’s but the Japanese garden, the lake and the mound made from the excavations predates that – it was part of the garden of the Royal Botanical Society and was constructed in the 1850’s. 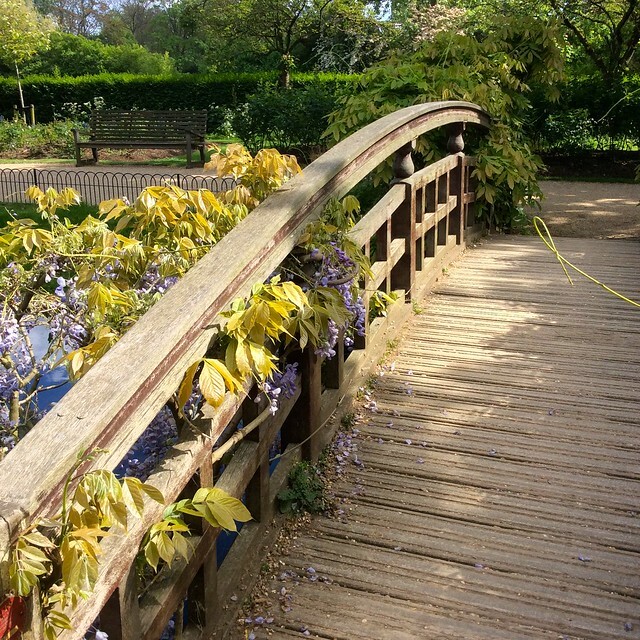 You cross to the island over a bow bridge which at this time of year is covered in wisteria. In Japan, wisteria viewing in early May is almost as popular as cherry blossom viewing in April, so it was lovely to see some in London. There are then a series of winding paths which lead you past a stone lantern and over gurgling streams, interspersed with a verity of shrubs and flowering plants. The island also gives you a views across the lake, overhung with willow and tranquil in the spring sunshine. 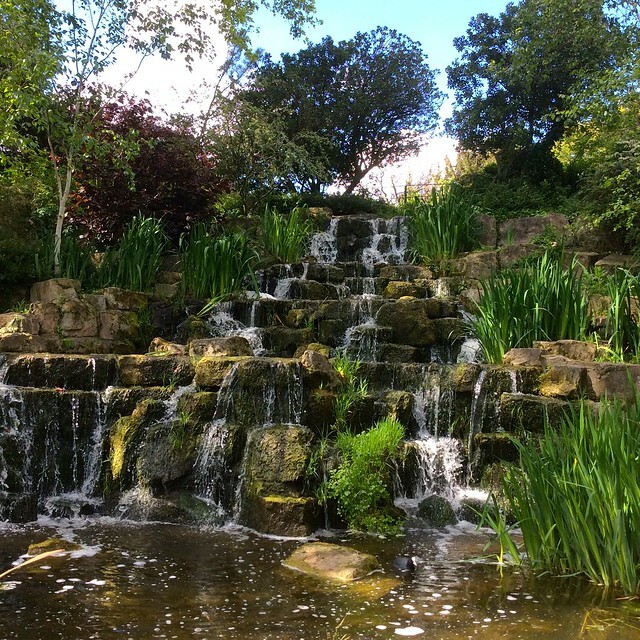 The waterfall is reminiscent of the waterfall in the Kyoto garden at Holland Park. (though, to be fair, the Regent’s Park one came first). You can climb to the top of the mound from which the waterfall descends and look down at the island from above. There’s a little open space at the top with a seat to rest on with some interesting plants around it – can anyone tell me what this one is? There’s very little information on the Eagle sculpture next to the island. It was presented to the Royal Parks in 1974 and dates from the early 19th century. It’s thought to be Japanese, which is presumably why they put it there. It’s Grade II listed. I’ll be going back to see how the garden changes over the seasons (it looks like there will be hydrangeas in flower soon, and yellow irises were just coming out), and, of course, to visit the rose garden when it blooms in about a months time. You can find the Japanese Garden just inside the Jubilee Gates. Take the tube to Baker Street and it’s a short walk from there. This entry was posted in Japanese Gardens, Regent's Park and tagged gardens, Japanese Garden, London, nature, plants, Queen Mary's Garden, wisteria by Fran. Bookmark the permalink. The garden is just round the corner for me as I live in Swiss Cottage. It’s a very lovely place. And I look forward to visiting it again soon. Thanks for reminding me of what’s on my doorstep! My pleasure! I’ll be going back soon as well. The plant with the spiky leaves and berries is a mahonia. Not sure what species though. The one below the eagle is viburnum plicatum. Thanks! I knew someone would know. A beautiful walk in the park – thank you! I just discovered this garden earlier this year too on a hunt for cherry blossoms, it is lovely. Yes, and the cherry blossom at the Jubilee Gate is fantastic too! (sadly over for this year though). I didn’t know about this so thank you. Beautiful! It is lovely – hope you get a chance to take a look. Lovely pictures and thank you, I’m a Londoner and have never visited this garden so it’s on my list for 2017. The plant, as I expect u know by now, is Mahonia Japonica. Winter flowering and very fragrant. Thanks again. Thanks for telling me – I hope you enjoy the garden! How much is to see this place? It’s free – it’s just part of Regent’s Park.